This week Cloe, a good friend from Paris, has been in town visiting. Today we took a trip up to Philadelphia for some good ol’ tourism. But that good ol’ tourism just wasn’t working for us today. We tried to see The Carpenter House, but it was closed; we saw the Liberty Bell and were underwhelmed; and we just couldn’t bring ourselves to bother with the Constitution Center. What we did do was fantastic, or at least full of fantasy. We started the day at Philadelphia’s Magic Garden, on South Street. 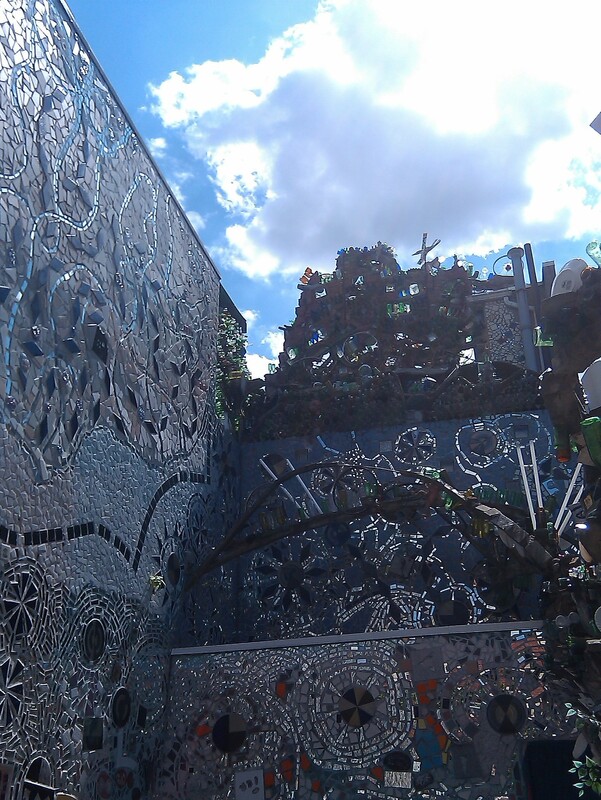 The Magic Garden is an amazing art in progress begun by artist Isaiah Zagar in 1994. It is mosaic, sculpture, poetry, and painting like you’ve never seen it before. And it is most certainly high on my list of 1001 things to see before you die. Here’s a little taste of the magic that is Philadelphia’s Magic Garden. With these poetic fantasies dancing in my mind, we continued our tour with a yummy lunch at the Fourth Street Delicatessen, and a quick trip down fabric row. 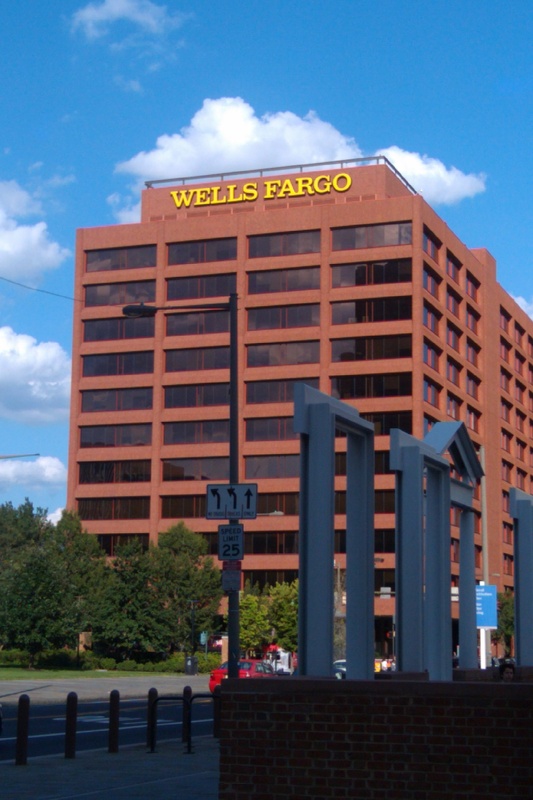 After spending entirely too much at the Pennsylvania Fabric Outlet we attempted our historically accurate tour of Philadelphia’s National Historic Park, which includes the major sights: Independence Hall, Liberty Bell Center, Independence Square, the Constitution Center, and the Massive Wells Fargo building. Wait, what? Liberty, Independence, and Low Interest Rates. Perhaps it was the looming shadow of high finance, perhaps it was merely the food coma induced by a hearty lunch at a Jewish delicatessen, but we couldn’t muster the interest in classy brick buildings and well phrased praises of liberty and independence. 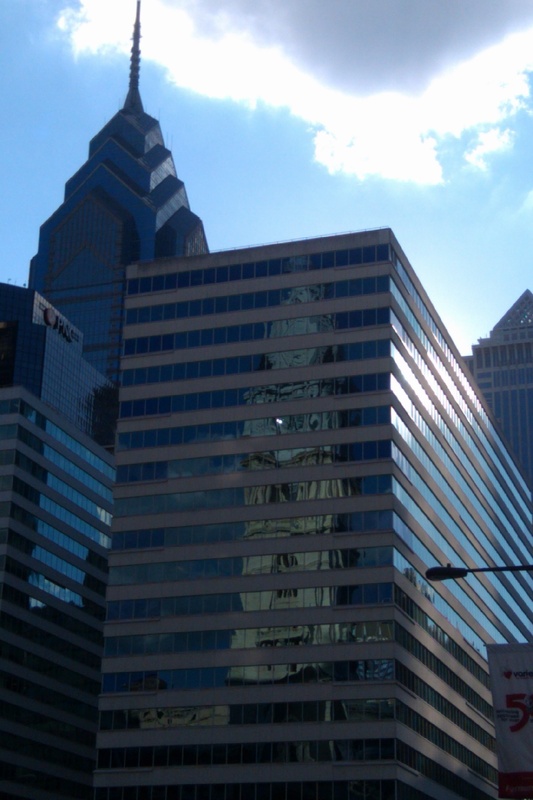 Instead we found ourselves on a meandering walk past Love Park, around City Hall, and down Broad Street. Once walking, like flashes of light in the corners of our vision, Wonderland kept catching our attention. Historic reflected in the Modern. 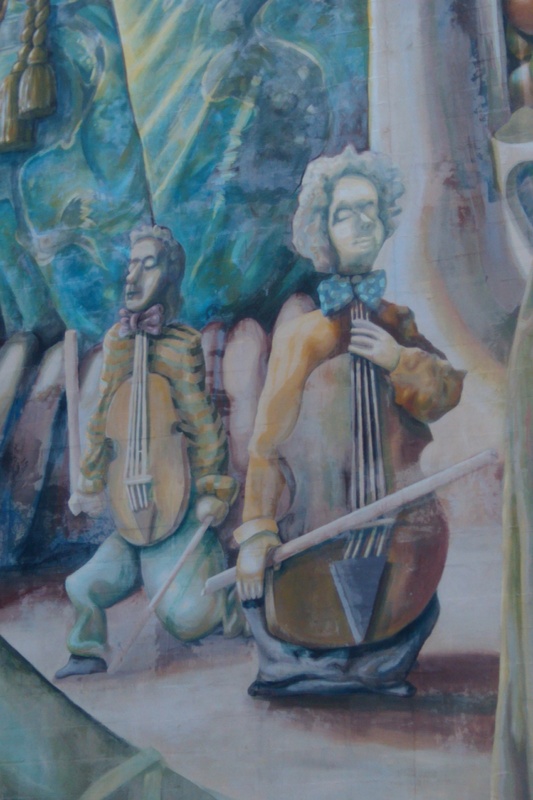 We found it on the sides of buildings- in murals painted and buildings reflected. Do passionate musicians become their work? It twittered mischievously with us over cake slices cut bigger than bricks and cookies with magically gooey chocolate chips. It delighted in board game pieces bigger than we were. We all but followed the rabbit through the crack in the bell before we decided to wink back at Wonderland for the present and hit the road home instead. It was a successful, unconventional, and extremely unforgettable day in the city. We started with a little magic, and found it’s glimmer all day. I hope you can keep your minds and eyes open for the glimmers around you, too! embassies, consulates, and visas oh my!